But very few people alive today have ever seen the majestic mature American chestnut tree that inspired Longfellow. The American chestnut, once prevalent across the eastern United States, became all but extinct after a fungal disease, accidentally imported from Asia, decimated the trees in the first half of the 20th century. The loss of the American chestnut has been described as one of the largest ecological disasters in history: Nearly 4 billion trees across 180 million acres were wiped out. In recent years, however, a broad effort has been under way to restore the American chestnut to its place in the landscape. And an orchard of small chestnut trees in Pittsfield’s Springside Park has become an integral part of a larger project to develop disease-resistant varieties of the American chestnut. The Pittsfield orchard -- officially the Robert J. Presutti Chestnut Orchard -- is operated by the Massachusetts/Rhode Island chapter of the American Chestnut Foundation. The city named it in recognition of Presutti, a local arborist who helped to launch the orchard and oversees the volunteers who manage it. The orchard, which was started in 2014, occupies about 1.5 acres of meadowland in the park’s interior. It contains 3,000 chestnut seedlings, plus several larger trees that were planted in earlier years of the project. The Springside Park site is among nearly 30 chestnut orchards that the foundation oversees in Massachusetts and Rhode Island, including another Berkshire County orchard in Stockbridge. It is also one of five “seed production orchards” in the chestnut foundation chapter’s bi-state territory; these orchards, the organization says, represent the next generation of its long-term breeding and restoration plan. Lois Breault-Melican, president of the foundation’s Massachusetts/Rhode Island chapter, said she and her husband, who’s also an active volunteer in the foundation, visited Springside Park while touring western Massachusetts several years ago. She and her husband, Denis Melican, live in Worcester County. Presutti, who before retirement worked in the military and construction, is certified by the Massachusetts Arborist Association. He works on trees at Springside Park and at other sites around the city. James McGrath, the manager of the city’s Park, Open Space and Natural Resource Program, said the local Parks Commission was receptive to the idea, which fit in with Pittsfield’s ongoing efforts to revitalize Springside Park. The historic 237-acre park in the city center includes an arboretum, greenhouse and gardens, playgrounds and recreational facilities, and large areas of woodland and trails. In recent years, the city and local supporters of Springside Park have worked to introduce new activities and make physical improvements to the park – including plans to upgrade the trail system and an ambitious restoration of the mansion at the park’s entrance. One of the city’s goals is for Springside Park to serve as a center for activities and educational programs related to nature. 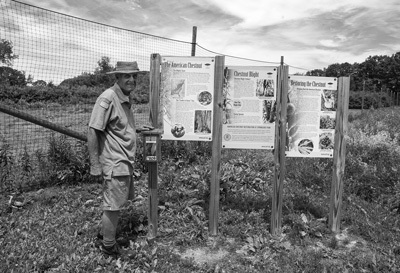 Presutti and the Melicans, who visit the site regularly, are overseeing maintenance of the orchard. Presutti said the project also has been aided by Brian Clark, the foundation chapter’s science adviser, who has set aside a portion of his family’s property in Ashfield for a chestnut orchard and has provided many of the seeds that have been planted in Springside Park. Public education and engagement form an important part of the American Chestnut Foundation’s programs, and volunteers have played a key role in planting the seedlings and performing other tasks in Pittsfield. Local organizations that have aided the Springside Park project include the Retired Senior Volunteer Program, the Berkshire Environmental Action Team and the Cub Scouts. Before the blight, the American chestnut had an important role in the nation’s ecology, economy and daily life. It was one of the largest, tallest and fastest-growing trees in eastern North America. In addition to its visual appeal, it was valuable for lumber for buildings and furniture: The trees had straight trunks, with durable wood that was resistant to rot. Proponents say wood from a revitalized chestnut tree population could add to the stock of sustainable building materials in the future, because the chestnut’s rot-resistance does not require the same level of artificial treatment as other woods. Chestnuts also were once a common source of food for animals and humans. The trees’ nuts ripened in the fall, just in time for the holiday season, and turn-of-the-20th-century newspaper articles showed train cars filled with chestnuts rolling into major cities to be sold fresh or roasted. Breault-Melican said that among other benefits, a revival of the American chestnut could enhance the nation’s food system. The overall initiative to restore the American chestnut is an ambitious, complex and long-term undertaking and involves many organizations, government agencies and individual growers, some of whom have undertaken related projects. But the ultimate goal is straightforward: to produce a modern version of the American chestnut that is resistant to the blight and can eventually propagate and grow naturally again on a widespread basis. Achieving that goal involves a complex and yearslong process that has harnessed a combination of arboriculture, traditional breeding and genetics, modern genomics, ecology and other disciplines. There were earlier attempts to restore the American chestnut in the 20th century, but they failed. In more recent decades, however, advances in genetics and breeding have made it possible to develop trees with more targeted characteristics. Restoration efforts have been undertaken by a number of organizations, and by individual growers, and the American Chestnut Foundation (www.acf.org) has been one of the leading participants. The nonprofit organization was founded in 1983 by a group of prominent plant scientists. Previously based in Bennington, Vt., its national headquarters are now in Asheville, N.C. The foundation has 16 state chapters from Maine to Georgia and west to the Mississippi River. It also operates the Glenn C. Price Research Farm in Meadowview, Virginia, where research and breeding take place. The foundation collaborates with other initiatives, including the American Chestnut Research and Restoration Center of the State University of New York College of Environmental Science and Forestry in Syracuse, N.Y., and the U.S. Department of Agriculture, among others. At its peak, the American chestnut is believed to have accounted for about 25 percent of all trees in the Appalachian Mountain range. But the fungal disease Cryphonectria parasitica, accidently imported in plant material from Asia, was first detected in 1904. In the succeeding decades, more and more chestnut trees were killed off as the blight spread. Although the American chestnut has all but disappeared in its mature form, the original tree still exists. There are scattered mature survivors. And in some places, chestnut roots continue to survive and produce trees, but the new trees that sprout usually succumb to the blight while they are still young. Other chestnut varieties are still prevalent in Europe, Japan and Asia. Some of these, including the Chinese chestnut, have been imported to the United States and planted on a comparatively limited basis to produce nuts. One basic strategy in the foundation’s effort to create a blight-resistant American chestnut has been to carefully cross-breed samples from remaining original American chestnut stock with the Chinese variety, which is more bush-like but is naturally resistant to the effects of the blight. The objective is to create a new version that combines the size and other characteristics of the traditional American chestnut with the natural immunity of the Chinese variety by diluting out most of the genes inherited from Chinese chestnuts except for those involved in blight resistance. This is a highly structured process in which samples of surviving American chestnuts are collected, cultivated and crossbred with Chinese chestnuts over a number of generations. Trees also are inoculated by deliberately introducing the blight to develop resistance. The process also attempts to develop chestnut tree variations that reflect more specific regional characteristics and are better able to handle other environmental factors. The foundation’s strategy involves the integration of three major parallel tracks it calls 3BUR (the acronym stands for Breeding, Biotechnology and Bio-control United for Restoration) to merge backcross and transgenic programs while also pursuing these approaches separately. The potential use of genetic modification has raised some concerns similar to controversies over genetically engineered foods. But Breault-Melican said most of the foundation’s efforts focus on more traditional breeding techniques. 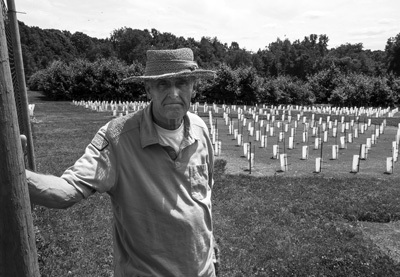 The foundation began planting test trees in the 1980s. These early generations were first harvested and tested in 2007 and 2008. One of the foundation’s breeding orchards was established in 2006 in Stockbridge at a location east of Route 7, just south of the town center. Breault-Melican said that property is open to the public for visiting. The foundation currently is making blight-resistant chestnut seeds (nuts) available on a carefully controlled basis to its members. While it supports increasing plantings, the newer varieties are still in the development phase, and access to seeds is limited. The seedlings at Springside Park are produced from trees at 23 older breeding orchards and other sources as a step toward producing a stock of seeds that eventually can be planted and cross-fertilized at other sites. Breault-Melican explained that the orchard in Pittsfield is focused on seeds from the fifth generation of the hybrid trees. The seeds that are produced there will become the sixth generation, which is the stage at which the trees will be considered sufficiently blight-resistant for wider release and testing in the larger environment. Although a large number of seedlings have been planted, over time most of these will not survive or will be weeded out because they are not sufficiently blight-resistant or are otherwise undesirable. Over time, foundation officials hope the Springside Park site will become a grove of blight-resistant American chestnuts with up to 20 mature trees. These will produce nuts that eventually could be distributed to propagate naturally on a more widespread basis. Breault-Melican said achieving full restoration and reforestation of chestnuts is taking place in stages, and it will likely be at least another 20 to 30 years before the success of the effort becomes apparent in terms of the trees’ survival in forests and other settings. In addition to perpetuating the American chestnut, foundation officials see a related goal as preparing a template that could be used to bring back other types of trees and promote biodiversity. Presutti noted, for example, that he has been involved with efforts to revive the American elm, another once prevalent tree that was decimated by disease.